Very hot day. Towards evening, when it got cooler, went up to the allotment and dug out a lot of bindweed growing in the orchard. There was a lot of it, but I think if I can keep it under control by digging it out as it appears, it will weaken it. The roundup doesn't seem to have done a lot! Planted the two giant courgette plants plus the custard marrow in the bottom marrow plot, and a trailer in the top one. Still no carrots. Ho hum. More of an allotment day today. Out quite early and planted up the Verina leeks and the spring onions (which are almost fully grown anyway). The canes I'd used for the broccoli bed hadn't worked (too flimsy) so figured I'd have to get some more wood chopped to a decent length. Began to drizzle as I finished off planting out the beetroot modules, so I stuffed the largest trailing marrow in and ran for it. Later on, went back to the allotment armed with wood and broccoli. 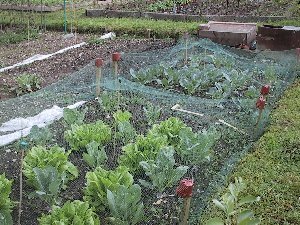 After the requisite cursing at netting with a mind of its own, I now have a much taller netted cage with tiny plants in, interplanted with romaine lettuce seed. And Lee gifted me his spare full-sized sweetcorn, so I now have nine tiny plants covered with bottles. Together with the 19 I have at home, I now have enough for a block of 28, 7x4 at a foot spacing. Should do nicely! Planted out the onion sets, but in modules so I can get them up to speed rapidly. And it gives the carrots a bit more time. Also planted another module tray of spring onions, in the hope they'll grow a bit faster than the last lot! There are a lot of trays now sitting on top of the cold frame rather than in it. Took the shears on up to the allotment and spent a good couple of hours cutting the paths again. And discovered about seven anthills in the process. Oh well. For quite a lot of the time, I was snipping away at my side and Lee was snipping at his. So our paths look quite nicely tidy now. The lettuces are getting quite large now! The broccoli are settling in now. Something's eaten the stems of the two long green marrows <grumble> so I'm going to have to replace them. And possibly slugbait, which I don´t really want to do. Potted up the three new long green marrows, as I'm going to need them, and stuffed in the French beans that I collected off the Berggold plants (well, can't hurt). Showers. 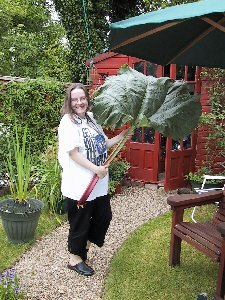 I dread how big the allotment weeds are getting. Another marrow - Table Dainty - is up. Must plant the sweetcorn this weekend, and mulch them with more manure. Took sweetcorn outside and left them there to harden off a bit. Minimum temperatures this week are over 10oC so they should be fine now. Went to allotment and weeded the carrot beds a bit - there are all of 7 carrots growing in total. When weeded I'll resow (again) one of them. Ditto the French beans, though tempted to start them off inside. 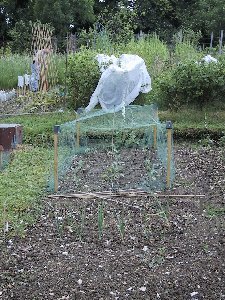 The slugs have eaten all of the trailing marrows now, so stuck the beer trap in the centre of that plot and we shall see. I think at least one of the yellow courgettes has taken, so first one soon, hopefully. Biggest shock was the snowball caulis, which are growing heads. I thought this meant they were buttoning, but after consulting my seed packets, they are supposed to crop in June/July, and so should be growing heads by now! Picked a lettuce, and they are pretty solid for a flat… so am now thinking they are romaine, just a very open hearted variety. Picked 5lbs of rhubarb and a handful of gooseberries to see how they were going. The rhubarb was a bit too much - now have to work out what to do with all of it! This morning's surprise was that the yellow French beans I collected from the plants I've been growing indoors since January have germinated! I wonder what they are going to look like - should be consistent as I don't think Berggold are F1. Grin. Quite a few little purple flowers open now on the chilli peppers. Cucumber plants getting progressively bigger. Didn't rain for once so went up to allot armed with the sweetcorn plants. Finally! Managed to get them all in (just) and they really do dwarf the ones Lee gave me! Went back to the car to pick up the hoe, and came back prepared to weed. 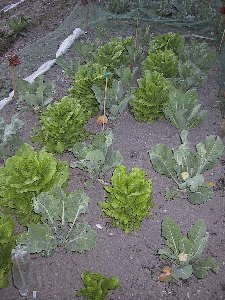 It took ages to get through the cauli bed but it looked so much better when done. The first few lettuces are poking through the broccoli bed, and the blackcurrants are starting to ripen. Picked a couple of pounds of gooseberries. The apple trees are covered this year - including the russet. Oh help. Maybe I'll have to sell them for charity! Still, there may yet be more dropping before the end of the month. 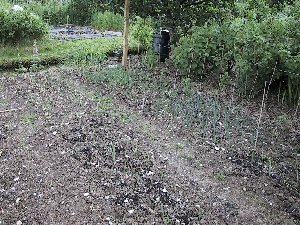 There are quite a lot of creeping cinquefoils through the mulch in the orchard so will have to come up and see to them with the roundup again, though not till the wind drops a lot. Beetroot are doing nicely now (new leaves) and the cabbage leaves are starting to curl in the centre. The gold rush courgette has got at least one that's taken. Picked 2lbs of green gooseberries to try and thin the bushes out a bit. The beer trap's caught a couple of slugs. Back at the ranch, there are now six or so Table Dainty marrows up and ditto the French beans from the collected seed. Amazing. Really hot day after a so-so fortnight. Didn't really cool down enough to be feasible to go to the allotment until quite late (nearly 8pm), but that wasn't a problem thanks to the light levels. 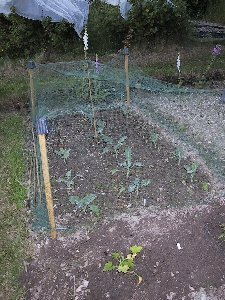 Planted another long green trailing marrow and gave up the organic principles by slugbaiting it and the cauli patch. One slug was trundling over the cauli floret eating it… so I guess it was necessary. It's the pesticide sprays I am really bothered about in any case. Planted the calendulas around the top marrow patch and alongside the bottom of the sweetcorns, and propped up a corn that had bent in the wind. Had a go with the unpowered lawnmower Lee had acquired - yikes it's hard work, mostly because the blade is driven by the outer wheels and if they slipped off the side of the path it stopped dead. So doing edges is impossible. Still, at least the middle's been redone again! Traded a few calendula for some courgettes (including round ones!) and planted two between the broccoli and the autumn onions, and one in the gap at the end of the leek bed. Have lots of Table Daintys coming though, so won't be using the round ones to fill up the main marrow bed. Will probably shove them in at home for a laugh. well I did manure a bed, so they should be fine. Hoed half the autumn king carrot bed and resowed a couple of rows of those, and a single row at the cauli bed side of Nantes Frubund, which should catch up. The other half of the bed has a few carrots in already, so can't be hoed clear of weeds. I can always try again with the other carrot bed too, with a marrow in too if room. Picked a lot of gooseberries for Dad, and watered everything. Left at 10pm. Up to A. with the five French bean seedlings and put them in. I hope they manage! Picked a few more gooseberries as they were trailing over the access road and I didn't want a repetition of last year's scything. OK that was mainly the blackberry but I was tying that in at the same time. There are four new briars so far, so should be able to get rid of a lot more dead wood come the winter. Pulled a garlic just because I was curious - not as big as it could be so am leaving the rest for another month or so. Shallots doing fantastically, though onions still a bit small and tatty compared with a lot of other peoples'. At least I have the modular Sturon ones at home to go in. There should be gold rush courgettes ready by the end of next week! A couple have taken and are off. 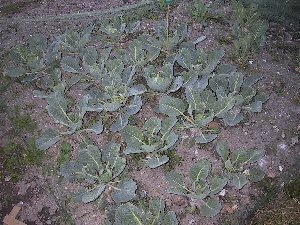 Weeded the cabbage bed, so that looks a lot tidier now. Not much doing today as it was the barbie, though dragged Sam up to the allotment and cut a couple of lettuces and took Jim up on his offer of rhubarb. Sam astonished by the size of the stems. Mind you so was I! The rasps are going red, so ate one! Gorgeous day again. Up to allotment after food and worked my way through some of the to-do list. Bunged the first lot of modular onions into the top carrot bed, in the half where a paltry five had germinated. Figured companion planting could work. So that bed doesn't look as bare at last. Alternated planting things with tons of watering - did a lot of the smaller plants and all the alliums. Also growmored the alliums too. 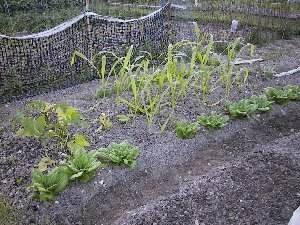 Mulching the sweetcorn was fun - if hard, as the manure has still claggy under the top layer. Marvellously water-retentive, so should work a treat. The corn are perking up a bit now, with new leaves coming and the stems are looking a bit bigger. Ate another couple of raspberries and a few blackcurrants. Am quite scared at the number of blackberry flowers - I reckon that because I pruned them as you should do, it's doubled the flipping crop. Help. It was too much last year! Courgettes still growing nicely, though I need to water them more. Planted some more long greens and a pair of table dainty. Watered everything at the allotment, and then did Lee's plot while I was at it. Should help keep things ticking over.